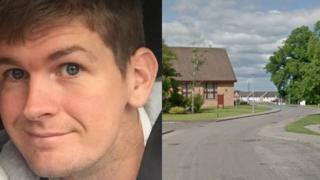 Police officers searching for a 30-year-old man missing in Inverness have urged members of the public not to approach him. Richard Finnis was last seen at about 13:20 on Saturday in the Kinmylies Way area of the city. It is understood he may have left the area in a blue Citroen C3 car with the registration SD18 WKE. Detectives are appealing to anyone who has seen him or his car to get in touch. Mr Finnis is described as being about 5ft 10in tall, of medium build, with dark hair and blue eyes. When last seen, he was wearing a sky blue tracksuit top, light blue jeans or tracksuit bottoms and a dark grey bobble hat. Det Sgt Craig Still said: "We are urging anyone who has seen Richard or may have information as to his whereabouts to contact us. "If you recognise the vehicle described please get in touch. We would urge members of the public not to approach Richard but to contact police in the first instance."